In Hawaiian culture the word 'Kahuna' means someone who is especially talented or possesses unique skills. It's become a popular term across the English speaking world and has now had the honour of a Poker machine adopting the name. 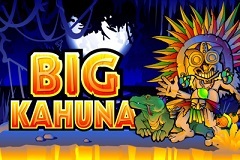 Big Kahuna has been released by Microgaming and features the cartoon style that so many of their games are designed with, plus some fun, if brief, bonus rounds and like all of their games, it's independently checked for fair play and trustworthiness. This vividly coloured game has the classic 5 reel and 9 line layout, with symbols in 3 rows. It may not be the last word in sophistication but it’s been popular for some time, so Microgaming clearly know what they are doing. It’s got a decent enough bet range as well, with players able to stake just 0.05 for each spin, or they can put 10.00 on each line for a total of 90.00 a go. It goes without saying that having a bet on anything other than all lines means that the wait for a winning combination could be a long one, while there’s nothing more frustrating than seeing a nice winning combination turn up on a line that’s not been activated, so the advice is always to place a wager on all lines and simply adjust the amount on each one to suit the bankroll. Back to the reels, and big, bold, bright symbols dominate, making Big Kahuna a feast for the eyes, even if the graphics are fairly two-dimensional. Kiwi fruits, oranges, watermelons and raspberries are supplemented by a Komodo Dragon and dancing warrior, all of which win cash for players when landing on a payline, across adjacent reels, starting from reel 1 on the left. Payouts are expressed as multiples of the amount staked per line, so a player with a 1.00 wager on each line for example, will win 10.00 of 3 raspberries land on a line, or 100.00 for a full line of 5 raspberries landing right across the reels. The highest paying regular symbol is the dancing warrior, who carries a prize of between 10 and 500x the line bet, with only 2 needed on a line to win. A couple of bonuses and extra payouts are triggered by wild and scatter symbols, with the wild simply being the Big Kahuna logo. It can act as any of the fruit symbols if it will help to complete a winning line, plus there are some generous prizes paid out when the wild makes up a line on its’ own, with a single one equalling a win of 2x the line bet, and going all the way up to a full line of 5 wilds brings the jackpot of 8000x the line bet to the lucky players who hit this elusive combination. A cheeky monkey face is a scatter symbol, so it doesn’t have to be on a payline to equal a winning combination, while all scatter payouts are multiples of the total wager per spin, not just the line bet. Two scatters will reward players with 3x the bet and should 5 appear after a spin, the prize is a nice 200x. In many pokies, the scatter is also the trigger for a bonus round, but in this game, that job is left to others. On to the bonus rounds, and there are 2 separate ones here, both of which are pretty quick games, so fans of free spins rounds will be disappointed to see that there are none featured in Big Kahuna. In no particular order, there’s a Volcano bonus and Mask bonus. Each one is perhaps unsurprisingly, triggered by either a volcano or mask symbol, with 3, 4, or 5 of each on an active payline launching their respective games. The Volcano round sees pieces of fruit lined up, and the aim is to pick one to be sacrificed to the volcano. A prize value is hidden within each one, so it’s just a matter of luck if the highest value fruit is selected, but at least some sort of win is guaranteed. The Mask round is only just more engaging and sees 10 Tiki masks on display. Players click on them in any order, revealing prizes as they do so, until a ‘Collect’ mask is chosen, ending the round. Big Kahuna or Bad Kahuna? This game is certainly colourful enough and looks pretty good despite, or maybe because of, the simple graphics. What’s not so good are the bonus rounds which take just seconds to play, but anyone who can live with this will find themselves playing a game that has a respectable 96.16% Return To Player ratio and some decent payouts along the way.